We could put kids in a playroom for a day and ask them to sit quiet and listen to us (or, we could try – the kiddos may have something else to say about it!). But, there is nothing quite like spontaneous learning, in real-life contexts, to help kids learn. Things happen throughout a preschool teacher’s day – often by accident – that can create opportunity for instilling knowledge into a toddler or preschooler. These are often referred to as, “teachable moments.” But, how do you find and use teachable moments as an early childhood educator? Below we’ll give some tips on this subject! Teachable moments are known for being “unplanned” and surprise happenstances. A child may come across a situation which delivers the perfect context for imparting impressionable wisdom. Opportunistic early childhood educators (and parents alike!) keep an eye out for these moments. If you’re always ready to teach, you’ll find ways to incorporate lessons at times that may otherwise be missed. This has been referenced as “intentional teaching” by some. For example, one pre-k class in Miami found the perfect teachable moment to explain shadows – after a fire drill! The kids were all standing outside in the sun, casting shadows onto the cement. There you have it – a real shadow, and a real application to explain the phenomenon. If you keep your eyes open, you’ll see there are many times throughout the day that teachable moments can happen – it’s up to you to prevent them from escaping! 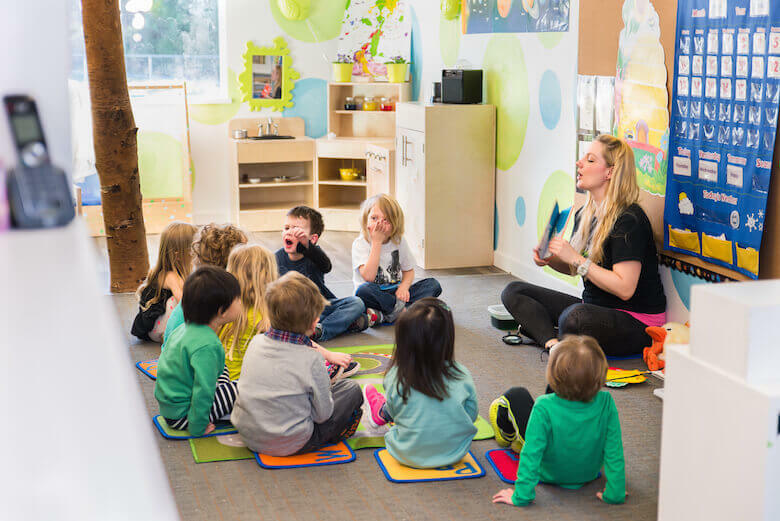 There are many ways you can set up a daycare or preschool classroom to create teachable moments as an early childhood educator. In our article about what makes a good daycare space design, this topic is also mentioned; that daycare classrooms should be age-appropriate and contain educational toys. You don’t have to spend a lot of money to do this either. You can create awesome preschool classrooms that create curiosity by using simple materials. For example, encouraging sensory development with sensory activity stations (think: water and sand, coloured rice, etc.). With sensory tables in your daycare, teachable moments are bound to occur naturally – even though not entirely by accident, since you technically set up the context on purpose. But this is important: you let them lead the play, and watch for teaching opportunities they create themselves. Let’s say kids splashing water creates bubbles, or water they mix with dirt creates mud. Those can raise questions within a child. When they ask you about them, or if they look puzzled while playing at these stations, you’ve got yourself a teachable moment! At this point, you’ll want to open up the conversation with them by explaining the science of what just happened. Then, to keep it open-ended, ask them what might happen next if they do X, Y or Z with the materials they’re playing with. What happens if the mud dries up? Will the xylophone make a different sound if they hit it harder? How many shapes can they make with play dough? These are, in effect, scientific lessons that can happen ‘in the moment.’ They provide excellent context to help a child remember cause and effect. Your teachable classroom can extend far beyond setting up a sensory development centre. As these other early childhood educators point out, teachable moments in the classroom come from things like vegetable patches and classroom pets, too! As this mom explains, teachable moments can come from normal, routine activities that preschoolers participate in. When you have routine, you can find teachable moments that need to be reinforced, especially for the little ‘monkeys’ in your classroom who need more than one day to learn a lesson (such as socially acceptable manners, the memorization of shapes, and so on). As adults, even we learn through experiences like this. We can’t expect that all our knowledge will come from textbooks and being told this or that by someone else. Sometimes, we need to go out into the world to practice and apply our knowledge, before it ‘sinks in.’ It’s no different with kids! Except that, little ones are still learning the basic lessons of life, and we need to understand that as early childhood educators. Preschool routines can help to instil long-term knowledge into children, by re-introducing topics time and again. Having snack time while sitting at tables and chairs, talking with each other, and then cleaning up afterwards creates a host of lesson opportunities. For example, kids can learn manners, like making eye contact, and can be encouraged to get along and feel included. They can learn about food safety, cleanliness and cross contamination from germs, plus allergies and why they shouldn’t share food as a result. Then, outdoor play time in nature can introduce daily observable lessons, such as watching leaves turn brown in the fall, or seeing baby ducks appear in the pond every spring. Why did the leaves fall to the ground? How did the baby ducks get there? Play is how kids learn, and this principle can be applied in all types of play-based learning routines – from developing motor skills, to forming bonds and more. This can, of course, go on and on with examples! But we think you get the idea! On the one hand, you can find and use teachable moments without even trying. But on the other hand, your efforts at both creating these opportunities, and recognizing them, will make for even more learning. Early childhood educators shouldn’t only rely on their prepared lessons for the day to teach their preschoolers. They can look out for sparks of interest a child may have, or questions that come up throughout the day. It’s ok to take a little break from the planned lessons to delve into these teachable moments!